Photographed by Mark Williams and Sara Hirakawa. Styled by Karla Welch. Hailee Steinfeld wears a dress, $3,700, by Lanvin, bracelet, $2,400, and ring, $1,425, both by Delfina Delettrez. Hair by John D. for starworksartists.com. Makeup by Jenn Streicher for starworksartists.com. Manicure by Lisa Postma for Tracey Mattingly. When asked where she wanted to meet for her exclusive face-to-face interview for FASHION Magazine’s March 2013 issue, Hailee Steinfeld was strategic about her choice. Picking the Fred Segal café in Santa Monica, the Oscar-nominated actress wanted a place where she was surrounded by racks of designer clothes so after she finished talking shop, she could shop around. On her to-do list was getting a dress that she intended to wear to her 16th birthday party, an invite-only bash that was thrown in her honour at the Rolling Stones Restaurant on Hollywood Boulevard. The Louis Vuitton look she went with may have ended up getting major posts around the net—and a few snaps in People magazine—but the day she met up with me, there was another designer Steinfeld was thinking about. 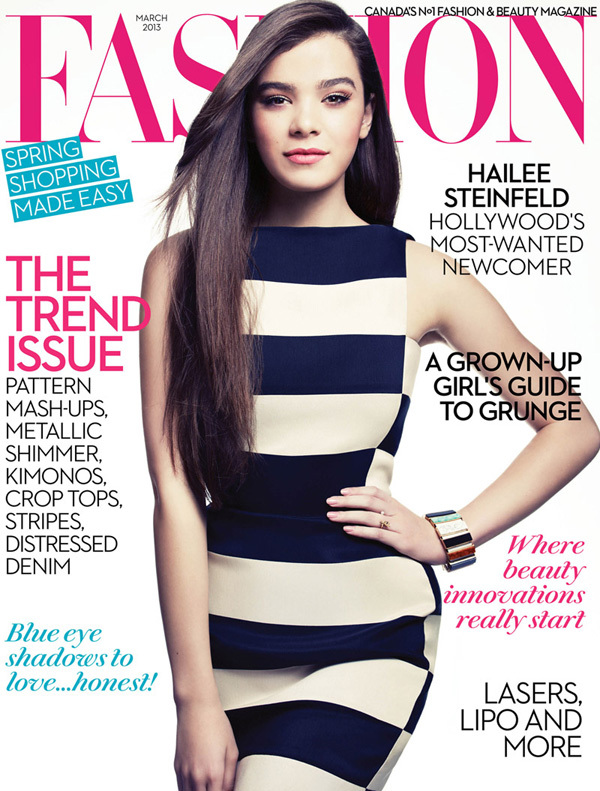 For more on Hailee Steinfeld, pick up the March issue of FASHION Magazine, available on newsstands February 11, 2013.